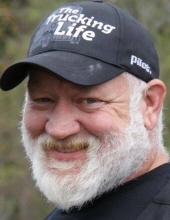 Mr. Rodney (Hot Rod) Smith, 49, of LaGrange, passed away, Sunday January 27, 2019, at his home. Born June 16, 1969 in California, Mr. Smith was the son of the late Bobby Lee Smith, Sr. and the late Kathie Tidwell Marchman. He worked at Doss Deer Processing, enjoyed motorcycle riding, and was a jack of all trades. Survivors include son Austin Smith of LaGrange; sisters, Kimberly Shelton of Greenville and Terri Smith of Georgia; brothers, Bobby Lee Smith, Jr. of Hogansville, Jody Edward Marchman, and Jason Samuel Marchman, both of Luthersville; and a granddaughter, Winsley Teal Smith. In addition to his parents, Mr. Smith was preceded in death by his wife, Suzette Denise Smith. The Guardian family will host Hot Rod’s last ride at 11:00 a.m., Saturday, February 2, at Guardian RC, 107 Lovelace Rd, West Point, GA 31833, with a memorial service after the ride at 2:00 p.m. at Guardian RC. Claude A. McKibben and Sons Funeral Home, Hogansville. To send flowers or a remembrance gift to the family of James Rodney (Hot Rod) Smith, please visit our Tribute Store. Motorcycle ride to begin at 11:00 a.m. at Guardian RC with service to follow at 2:00 p.m.
"Email Address" would like to share the life celebration of James Rodney (Hot Rod) Smith. Click on the "link" to go to share a favorite memory or leave a condolence message for the family.